As I continue to shake-off the side effects of the final round of chemo I find myself clocking up a rather impressive tally of post-diagnosis 'firsts'. Unfortunately my scalp still refuses to sprout any new locks and my attempt to "fake-it" with glue-on lashes failed spectacularly when their removal ripped-out the pitiful few that had survived the chemo regime but none of that has succeeded in wiping the smile off my face, this journey is starting to feel like it has a conclusion. The plastic surgeon injected an additional 250ml of saline into my fetching temporary rectangular implant and it had a rather unexpected impact on my confidence; I found myself admiring my new rack at every opportunity, even that small change was enough to make me feel relatively normal again, it's not enough to make me brave a bikini on holiday - I'll save that for the reconstruction at the end of the year. The most dramatic first has undoubtedly been my return to the bike. She had been feeling rather unloved as I hadn't paid her any attention since the diagnosis back in December but it seemed that all was forgiven as I braved the turbo-trainer for the obligitory celebratory photos and a flash of misguided inspiration convinced myself to get onto the tarmac. 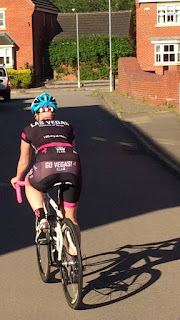 I can't describe how proud I am to finally wear the special edition LVIS kit in support of this blog and in honour of everyone fighting breast cancer. 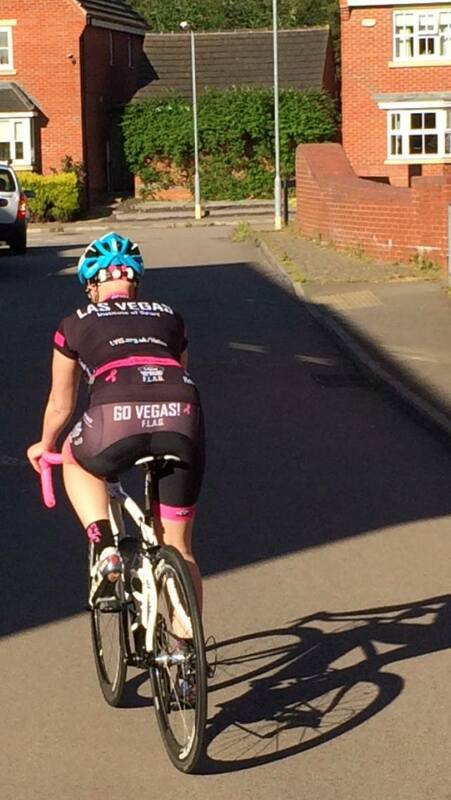 Unfortunately no matter how awesome your kit looks it won't make you go any faster. By the time I reached the top of our hill I was convinced that I was about to pass-out. I probably only managed to ride 2 miles at the most but they're the most important 2 miles I've ever clocked. It's crazy to think that those same wheels carried me from Edinburgh to Paris back in the summer of 2009. I rode over 1,000 miles that summer but today only 2 made me feel physically sick. Cancer has taken enough away from me, it's not having this, I'll work back up to fitness one mile at a time.